This fall marks the 20th anniversary of the Toronto Blue Jays first World Series Championship in franchise history. While we should be celebrating this momentous occasion, the 1992 World Series is a bittersweet reminder of an era that is well in the rear-view mirror. Frankly, it’s been so long since the Blue Jays have been in the playoffs that I’m beginning to forget what a postseason game is like. How sad it is that there are some Blue Jays fans who have no memory of all about a contending squad? Can you believe there are some kids who are growing up as Blue Jays fans and only hear second-hand how the Blue Jays won two consecutive World Series? 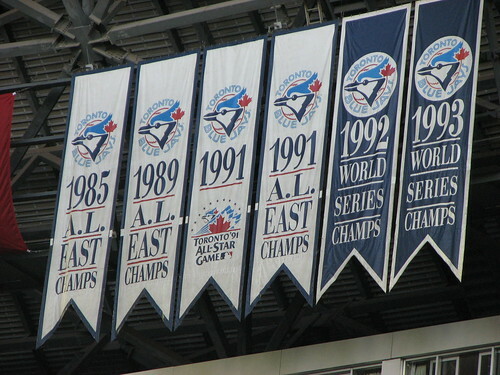 I mean … if it weren’t for the banners hanging from the roof of the Rogers Centre, you might not know the Blue Jays used to be a dominant force in the mid-to-late eighties and early nineties. There are days I dream of being there for a playoff game in Toronto. But like most fans, I’m starting to get tired of imagining what it would be like and would rather be experiencing it in person. Now that the Washington Nationals have secured their first playoff spot in 30 years, the Blue Jays now own the third longest playoff drought in baseball at 19 years. 19 years, folks … that is a damn long time. In past years, the Blue Jays front office has really driven home the point that they are trying to build a perennial contender much like the glory days of the team from the mid-eighties and early nineties. Unfortunately, sometimes even the best plays go awry. I can understand Paul Beeston’s frustration because with the addition of the second Wild Card, merely hovering above the .500 mark virtually gives any team a legitimate chance at making the playoffs. Beeston’s statement didn’t sound like it was directed at his team or even the competition, merely the situation that the Blue Jays are in. He sees the sudden surge of success the Oakland A’s and the Baltimore Orioles are having and simply wants that to be the Blue Jays. 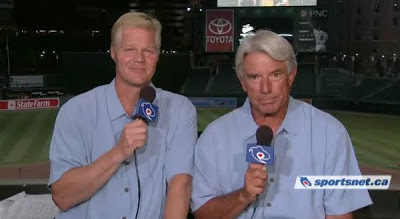 I definitely believe there is a little bit of envy going on with the Orioles and even the Rays these days. Baltimore had 14 consecutive losing seasons, and now it looks like they’ll finally end their playoff drought this year. The Tampa Bay Rays were the AL East doormat dwellers for nine of ten seasons, and then they totally came out of nowhere and made three playoff appearances in five years. And yet, the Blue Jays have been on the outside looking in while all the other teams in the division have made at least one playoff appearance. Think back to when the Blue Jays were constantly at the top of the American League East. That was incredibly when just the division leader made the playoffs. So now with the addition of the Wild Cards, the Blue Jays chances are actually better than ever to make the postseason. And yet at the conclusion of this season, it will mark 18 seasons since the Blue Jays have been in the playoffs. It’s especially hard to stomach that Toronto really hasn’t even been all that close to even making the playoffs since 1993. There was a brief period where they were in the Wild Card hunt in the summer of 1999, but that’s about it. I even remember in 2006 when the Blue Jays finished second in the division to the Red Sox and that felt like there was some sense of an accomplishment. When in fact Toronto finished the season three games from a Wild Card spot … but it may as well have been 300 games. By the tone of this post, I know it sound like I might have reached my boiling point as a Blue Jays fan, but I assure you that’s not the case. This season has been one bad break after another, and even the players and front office would echo the same sentiments. While I would love to see another World Series banner flying from the roof the Rogers Centre in the next few years, the Blue Jays don’t even need to go that far to satisfy my thirst for playoff baseball in Toronto. Even if they only made it to the Wild Card elimination game, I’d be more than happy with that. As we’ve seen man times in the past, even the best teams from Game 1 to Game 162 don’t always win the World Series. Simply getting into the playoffs gives the Blue Jays a chance; and a chance is at least some semblance of hope. I’ll still be a Blue Jays fan even if the team doesn’t make the playoffs for another 19 years. But I’d much rather tell my future children about the Blue Jays playoff berths in the 21st century rather than just the ones in the 20th century. This season reminds me a lot of 1986. Dave Stieb's horrible 4.5 months, the George Bell/Lloyd Moseby/Sil Campusano nonsense, Willie Upshaw losing his power with no warning… it's amazing that that team won 86 games. One can only hope that the Jays have exhausted their store of bad luck. The most recent example I can remember is the Yankees – a lot of people forget they've also had some pretty significant injuries (Rivera, Pineda, Gardner, etc), but they have managed to plug the holes much better via trades and their bench players.